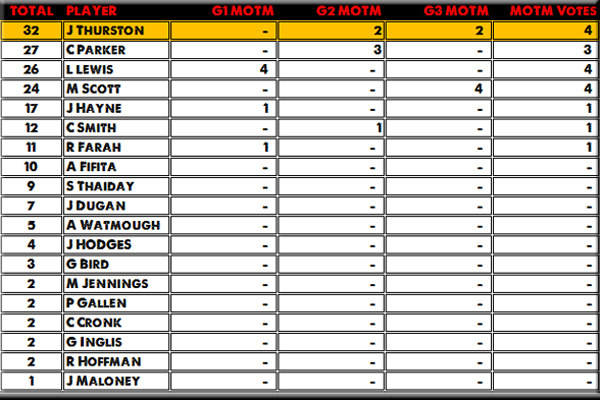 Thurston gained 2 more Man of the Match Votes in Game 3, to go with his 2 from Game 2 - meaning despite a duck egg in Game 1 when the Blues dominated the votes, Thurston finished 5 votes clear of runner-up Corey Parker and 6 clear of Game 1's Man of the Match Luke Lewis. Thurston's 32 votes in total came from 4 x 5 Votes (as a clear Man of the Match as judged by our 6 person panel each game) and 4 x 3 Votes (as 2nd best player on the field). He did not register a vote in the 2 vote or 1 vote categories - a good sign he was a dominant force in Games 2 and 3. Parker finished 2nd after picking up votes in all 3 games - tallying 27 all up from 4 in Game 1, 18 in Game 2 (including 3 MOTM votes) and a further 5 votes in Game 3. He was the only player to gain votes in all 3 games. 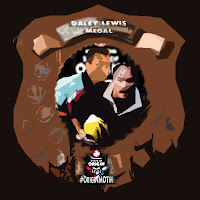 In 3rd place, Luke Lewis was one of only two players to gain 4 of 6 MOTM votes in a single match - joined by Man of the Match in Game 3 Matthew Scott (see Game 3 Voting below) - after picking up 26 votes out of a possible 30 in NSW's 14-6 win in the opening game of the series. He had 4 x 5 votes and 2 x 3 votes to be the most unanimous Man of the Match winner of the series. Matthew Scott was 4th with 24 votes, 20 of which came in his Man of the Match display in Game 3. Interestingly he did not receive any place votes from 2 of the 6 voters in Game 3. He picked up 4 votes in Game 2 via a pair of 2 Votes. Rounding out the Top 5 was Jarryd Hayne - simply put the biggest reason NSW couldn't win Game 3 - with 17 votes - all picked up in Game 1. Official Wally Lewis Medal winner Cameron Smith came in 6th with 12 votes - he was good in Games 2 and 3 but hardly the best player across the series. But then again a winger who made one good run in all of Game 3 was awarded the official Man of the Match so what would we know? Brent Tate is a goer, but that award is up there with Brent Kite and Darius Boyd both getting the Clive Churchill Medals ahead of (ironically enough) wingers Michael Robertson and Jason Nightingale in the 2010 and 2008 deciders. Smith picked up 8 votes in Game 2 and another 4 votes in Game 3 - finishing one vote ahead of Robbie Farah with 11 votes in 7th. Rounding out the Top 10 was Andrew Fifita in 8th with 10 votes, Sam Thaiday in 9th with 9 votes and Josh Dugan in 10th with 7 votes. 2013 State of Origin Player of the Series! Six Voters took part on Wednesday night during QLD's 12-10 win over NSW at ANZ Stadium: Ben Hoese, Greg Delaney, Matthew Duncan, Nigel Wilbow, Matt Spillane and Warrick Nicolson. GAME 3 VOTES - Follow #OriginMOTM on Gameday for live votes. 5 - J Thurston, 3 - A Fifita, 2 - A Watmough, 1 - C Parker. 5 - M Scott, 3 - C Smith, 2 - J Dugan, 1 - C Parker. 5 - M Scott, 3 - J Hodges, 2 - A Fifita, 1 - C Smith. 5 - M Scott, 3 - C Parker, 2 - R Hoffman, 1 - A Watmough. 5 - J Thurston, 3 - J Dugan, 2 - A Watmough, 1 - J Hodges. 5 - M Scott, 3 - J Thurston, 2 - J Dugan, 1 - A Fifita. 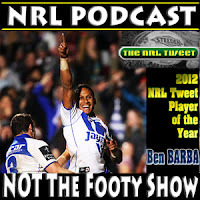 In the 2013 @NRLTweet Player of the Year Awards - You can follow the Votes live after each game via this Hashtag #NRLTweetPOTY and we publish all the Round Results in each week's Complete Set feature.